Career Opportunities - Are you a storyteller? This isn’t just a chance to work on great content or tell stories. It’s your opportunity to bring imagination to life. 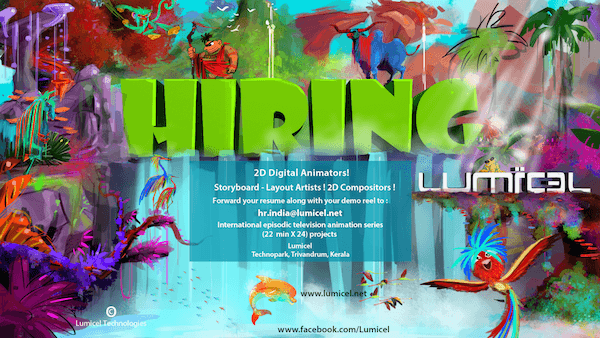 This opportunity is for motivated animators who is willing to push the envelope of what is possible in 2D digital animation. The animator will be able to effectively tell the story in a meaningful way through vivid and compelling character acting and movement. Should posses strong understanding of weight, locomotion, anatomy, dialogue, acting, appeal, and entertainment to bring the story to life. Successful candidate will be working in international episodic television animation series (22 min X 24) projects. Strong work ethic, communication skills and a good team player. Please include the position you are applying in the email subject line. Only selected candidates will be contacted. Selected candidates will undergo a time sensitive test to assess skill-set proficiency. If you think you have what it takes to join a fast paced/deadline driven team & environment, we are looking forward to hearing from you.